Russian scholar; born 1815; died at Wilna Oct. 21, 1852. He acted for many years as private instructor at Wilna, and then became teacher in a public school at Riga. Later he was appointed by the government head master in the rabbinical school of Wilna. 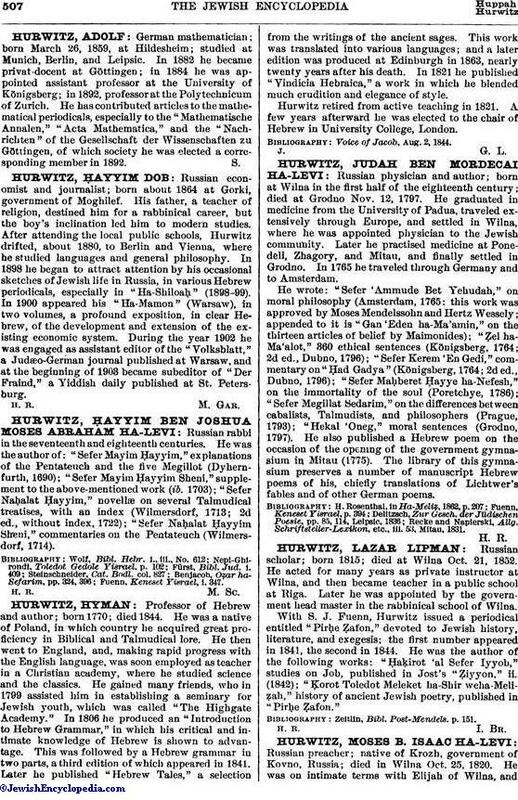 With S. J. Fuenn, Hurwitz issued a periodical entitled "Pirḥe Ẓafon," devoted to Jewish history, literature, and exegesis; the first number appeared in 1841, the second in 1844. He was the author of the following works: "Ḥaḳirot 'al Sefer Iyyob," studies on Job, published in Jost's "Ẓiyyon," ii. (1842); "Ḳorot Toledot Meleket ha-Shir weha-Meliẓah," history of ancient Jewish poetry, published in "Pirḥe Ẓafon." Zeitlin, Bibl. Post-Mendels. p. 151.